With only three days left for IBPS PO Mains 2016, the heat is on. As the exam approaches near, you start doubting your meticulous IBPS PO preparation and feel you are forgetting everything you have learned so far. Suddenly simple concepts start wreaking havoc on your brain and the negativity consumes your thoughts. If this is the case with you, don’t panic. You aren’t alone. Everybody goes through pre-examination stress and it is only natural that you are feeling the same. To alleviate your fears, we present to you tips and tricks prepared by our experts to beat examination stress in your IBPS PO Preparation. First things first. In order to concentrate better and manage your study better, remove all the distractions from the place of your study. This can be anything from your gadgets(phone, ipod, laptop etc) to a window. Every thing that distracts you makes your mind go crazy. Not only you start worrying about all the things that aren’t right, you also feel bogged down because you are unable to utilize your time to its full potential. So, set up a routine of removing all distractions from your study space and voila you will see your productivity increase by huge margins. To counter the boredom arising from continuously studying from long hours, try changing the settings around you. Research shows that you tend to retain more information when you study in different locations. That said, it doesn’t means that you need a palace to study. If you are feeling bored in your room, try the other room. Experiment with the lighting and you will feel that your mind is suddenly more receptive (not to forget more alert) and retains information better. We can’t stress this point enough. Your breathing plays an important role in your learning. Whenever your mind is blasted with thoughts like ‘this is so tough’, ‘there are so many candidates’ or ‘ohh my god! i cant answer this simple question’ etc, then practice deep breathing for 1-2 minutes. To practice that, just close your eyes and concentrate on the tip of your nose, breathe in and count till 7. Then hold the breath for 3-4 seconds and breathe out for 7 seconds. What is essentially does is REBOOT your brain enabling you to trash all the worries and start working with a positive mindset. Well a break never hurt anyone, did it? After 1 hour of study, make it a point to stop for 15 minutes and let your mind relax. You can stretch yourself, do a quick workout or just take a good ol stroll. The key is pausing the learning activity for 15 minutes. Research has shown that studying (learning in general) for continuous duration makes you lethargic. On the contrary studying with intermittent breaks has been shown to increase your learning. The problem with breaks is they extend very easily. You feel like doing everything (that you otherwise would never do) in that break time and a 15 minute break extends to 1-2 hours thereby disrupting your cycle of study altogether. Put a countdown timer or an alarm of 10-15 minutes and make it a point to get back to study once it is over. After you are done for the day, make a plan for the next day. Just a general plan to get you started. My personal plan is to get up, do a yoga session of 15 minutes, followed by stretching and a sumptuous breakfast. Then i start working on my articles. This is what works for me and i have a motto when i wake up in the morning. Use a calendar app to put the study schedule on your Calendar app. Check and update your calendar regularly to remind yourself of your study schedule. 1. Manage your time in such a way that you are able to go through all the questions at least once in the exam. The reason behind it is there are many questions which are deliberately designed to be complex and end up grabbing the lion’s share of time. A good time management strategy helps you identify questions which are easier and hence, can be solved in less time. a) Go for the English section first. It takes minimum time and you should be able to complete it in 10-15 minutes max. section takes minimum time. You should be able to attempt it in about 10-15 minutes. b) With English done in the first 10-15 minutes, you need to divide the next 45-50 minutes depending on your subject preference. If you are good in Quant, allot more time to it and vice versa. The ideal time to attempt Quant and Reasoning section is 20-25 minutes. c) So the order of attempt should be- English – section you are confident of– then the section you are most scared of. 3. In individual sections, attempt the questions in the following order: first the questions you know and can solve quickly, then the questions you think you can do but are time consuming. Remember never try and waste your time attempting the questions you are not confident of solving. There are a lot of other questions to solve and score. Your aim is to clear the paper, not top it. You can attempt the questions in two phases – in first phase attempt the questions which are easy and take less time to solve. In the second phase(if time permits) attempt questions which are hard. This way you will be able to clear sectional cutoffs and get a high score. 4. In English, only guess if you are at least 40-50% sure of the answer, i.e. you will be able to eliminate 2-3 options. Start with comprehension. This may take 5 minutes but has the highest accuracy. This will help you clear the sectional cutoff for English comfortably. Attempt cloze test and para jumbles next to increase your overall score. English section is the highest scoring section of the exam. 7. Although speed matters a lot, it can sometimes come at the cost of accuracy. Generally the following type of questions require speed. a) Reading Comprehension: You can consider reading the questions first before reading the passage. 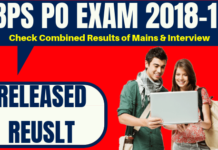 This way, while reading the passage itself, you will be able to mark the answers and all questions will be done in only one reading of the passage this will help you in your IBPS PO preparation. c) Long calculations- You can work on speed mathematics. Memorize Tables till 20, squares till 30 and cubes till 15. Click here for Speed Reading Tips and Tricks . 8. 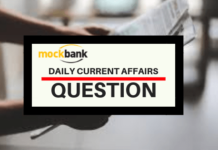 In the last 15 days, attempt at least 1 mock test daily with honesty for 1-hour duration. Appearing for mock tests help you gauge your preparation levels and help you improve upon them, if necessary. 9. Online mock tests simulate the official online exam scenario, enabling you to experience the exam in real time and get acquainted about navigation in the exam application. 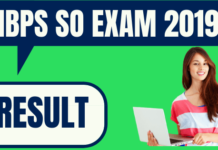 After attempting the online mock test, you can evaluate your performance and identify which questions took the maximum time and avoid taking them in IBPS PO Mains exam. You can also see your response vs the correct response and detailed solutions in the mock test. Follow this up with a mentorship call with an expert to help address the critical lacunae in your preparation. 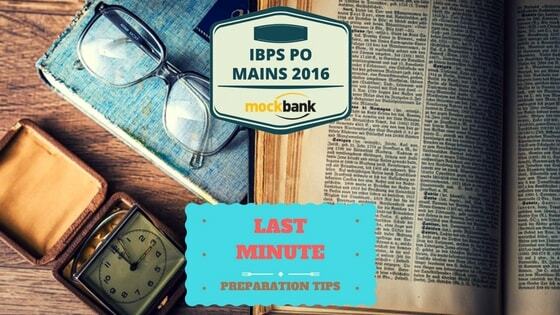 Friends this is it for IBPS PO Preparation Tips & Tricks. Feel free to ask us any queries and questions you have in the comments section below and we will be glad to answer them for you. We wish you all the very best for your IBPS PO Mains Exam.